That’s okay! 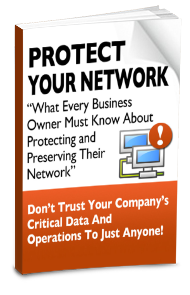 But to help you get to know us better, we’d like to send you a FREE copy of our recently published guide, What Every Business Owner Must Know About Protecting And Preserving Their Network. This free guide will arm you with everything you need to know, along with questions you should ask any computer consultant before giving them access to your company’s network. Even if you aren’t ready to outsource your IT support needs just yet, this report will give you the right information and questions to ask when the time comes. And if you have a feeling that your current IT guy is not delivering the level of service and support you need, feel free to contact us and we’ll be happy to help.